Theory and research in aphasiology have typically concentrated on a limited population--right-handed adult monolinguals whose language uses an alphabetic code. Bilingual individuals, ideographical code users, and children (among others) have been separated out. This book examines the available data from these "atypical" aphasics, asking whether what makes them different has a significant effect on language representation and processing in the brain. 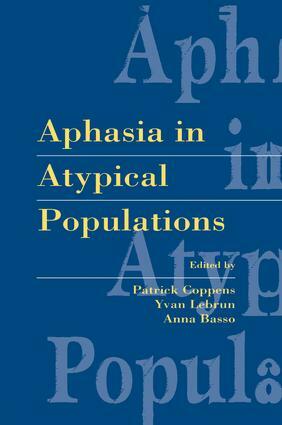 Each chapter reviews literature pertinent to a given population and explores whether (and potentially how) these populations differ from the "typical" aphasic population. The ultimate goal is to better understand whether the model of language used in aphasiology can be extended to these "atypical" populations, or conversely, whether significant differences merit the development of a new model. "Apart from the obvious science that forms an excellent foundation for each chapter, there are frequent references to individual case data that make the volume, not only an excellent theoretical reference book, but one that is also interesting and entertaining." Contents: Preface. A. Basso, M-L. Rusconi, Aphasia in Left-Handers. M. Paradis, Aphasia in Bilinguals: How Atypical Is It? P.F. Paquier, H.R. van Dongen, Is Acquired Childhood Aphasia Atypical? J. Gandour, Aphasia in Tone Languages. A. Yamadori, Aphasia in Ideograph Readers: The Case of Japanese. P. Coppens, M.A. de Mattos Pimenta Parente, A.R. Lecours, Aphasia in Illiterate Individuals. P. Coppens, S. Hungerford, Crossed Aphasia. D. Corina, Aphasia in Users of Signed Languages. P. Coppens, Y. Lebrun, A. Basso, How Atypical Are the Atypical Aphasias?